Botanicula is a a point and click adventure, developed by Amanita Design, whose previous work include the delightful Machinarium. 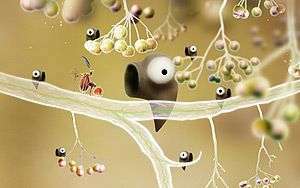 Much like Machinarium (and the odd, but strangely charming, Coloropus), there is no spoken or written dialogue – not in a traditional sense anyway – so while the story may seem obvious there could well be undertones that we’re not picking up on. On the face of it, however, a group of botanical creatures have banded together to try and save the last seed from their home tree, as it, and everyone else, faces total annihilation from some evil parasitic creatures. You’re not really given much more to go on than that and even the creatures you control – a selection of five different species – aren’t given names, nor are you given any sort of indication as to why they are being brave enough to get involved and help. It’s a minor quibble at best and really doesn’t take anything away from the story itself. The gameplay is relatively straightforward but is, ultimately, light-hearted and fulfilling. Most of it revolves around fetch quests or trying to find a particular item or collection of items with which to overcome an obstacle or gain access to a new part of the tree. It sounds a little mundane and, for the experienced adventurer, it might very well be. The opening few hours has you collecting various items, and while they, and the other objects that you collect, all feel like they make sense and are required for the given situation, it is just a series of fetch quests. While that may sound disappointing, fear not, because while the core gameplay feels a little lacklustre, the level of interactivity more than makes up for it. This tree, whose inhabitants are fleeing for their lives, feels like a living, breathing place. You can touch and interact with just about everything, so despite the repetitiveness of the actual gameplay, not only will you likely not care, there is a good chance that you won’t even notice. Every little movement, every click, every interaction is a joy to behold, because even if it has nothing to do with a puzzle, Amanita Design have still made it do something. This extends from something as subtle as the leaves following your mouse pointer as if its acting like a light breeze, to clicking repeatedly on an igloo and trying to discover how many penguins you can fit on a screen. If you’re questioning why an igloo has ended up in a tree, then this is certainly your sort of game. While a lot of what you’ll click on won’t actually have anything to do with the puzzle at hand, the interactions only reinforce the feeling that you are in a living environment, teeming with thousands of tiny creatures and plants that are busily trying to gather their families and escape, mount a defence, or who have, potentially, been killed by the parasites. The gameplay, despite minor shortcomings, is enough to hold your interest and is made all the more engaging by the graphics and art style. Its very difficult to pin down exactly what it is or how you would describe it – I’d have to go for a not-so-creepy Tim Burton-esque theme, mixed with equal parts Braid and Machinarium. In fact, imagine Machinarium but brighter, with plants, and you’ve kind of got it. Although games and their graphics often suit each other it’s very rare that the match makes it a better game – Borderlands is a great example of this and so is Botanicula. I can’t explain why it works so well, it just does. So much love and care has been put into each character, every item and interaction; you just don’t get this level of attention in many games, and, of course, it’s a pleasure to see and experience. Colours are varied and vibrant; this isn’t just a game that’s overly green because it has some plants in it. I’ve never seen so many colours in one title (and never seen them work together so well). Against the lush natural backdrops, the black that represents the enemy parasites only re-enforces the fact that they are evil invaders. The same can be said for the sound, which has been identified as award-winning in other circles. Here, a truly addictive soundtrack is only bested by the wondrous sounds of a world come alive, and one that is teeming with life that gives out little chirps and cheeps. The music itself stirs emotions of glee and fear as your group of would-be heroes traverse the various areas, scuttling away from danger, celebrating victory and striving to survive. If there is anything that can rival Botanicula’s art palette, it is the expertly-crafted music. If there is one sour note in this crescendo of graphics and sound it’s Botanicula’s replay value. Unfortunately, with the main story complete, there isn’t a whole lot to come back for, despite collecting some creature cards as you move through the story. Honestly though, the joy and fun of experiencing Botanicula for the first time is worth the admission price. Not every game needs to be played time and time again to justify its worth and, maybe, as a consumer, we expect to much of that in this industry. Take this adventure at face value and lose yourself in a world that you never knew existed. It's easy, when playing Botanicula, to laugh at something because it's so downright daft or silly. It isn’t silly though, which is to say the game is humorous; it will make you laugh, but not because it's being stupid, but because the touches and influences of its personality are so subtle and blend so well that it just feels natural to laugh. I can’t really describe it any other way. The whole game is dripping with a personality and substance so rich and innocent that it looks like it was made by a group of people who’ve not been tainted by anything evil in this world. This is an adventure that you don’t want to miss out on.